Gifted Hilton Head, Meredith Taylor’s aptly-named, darling shop snuggled into Village at Wexford, one of Hilton Head Island’s smartest retail destinations, is replete with gifts, and jewelry, and fashion, and gifts, and gifts, and more gifts—just exactly as Taylor planned it. With a desire to say yes to nearly everything that catches her eye, it is her decades-long retail buying and boutique-owning resume (Pittsburghers fondly remember Gifted Pittsburgh) that informs every decision to buy, or not to buy, for that matter. “A lot of people will say, oh, there’s so much in here, I have to walk around three times. What we find is they’re having fun with every walk through,” she said. Describing herself as an old-time buyer focused on what makes customers happy, Taylor is delighted with several new bridge jewelry lines arriving at Gifted HH this spring. Bridge jewelry? Bridge jewelry is positioned somewhere between what the industry identifies as fine jewelry (i.e. real gemstone, precious metals, expensive) and costume jewelry (i.e. inexpensive and ornamental). 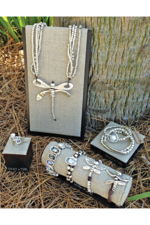 Gifted Hilton Head is brimming with beautifully-designed jewelry that stands the tests of time and wearability, while being priced just right to treat yourself or for giving. 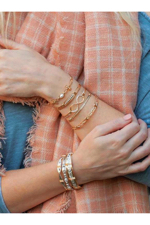 1.Ronaldo Designer Jewelry is perfect for stacking. 2.The UNOde50 line of sterling silver jewelry from Spain is offered exclusively on-island at Gifted Hilton Head. 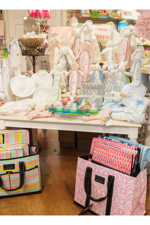 3.A display of baby gifts in shades of spring’s hot color – pink! With the introduction of John Medeiros jewelry this spring, Taylor has rounded-out her exclusive selection of bridge jewelry. “It is probably some of the nicest bridge jewelry you will find. It’s intricately woven, gold and rhodium plated, classic jewelry.” Handmade in America, John Medeiros pieces are gorgeous, and travel beautifully; elevating looks near and afar. So far, the focus here has been on the latest additions to the Gifted Hilton Head jewelry selection, absolutely, not to be missed. However, all those miles of walking all those market aisles, are the secret sauce to the lovely, uncommon, happy goods found throughout Taylor’s shop. From housewares and hostess gifts, to a drool-worthy children’s department (think bundles of goodies for babies, grandbabies, nieces, and nephews), to fashion, books by local authors, along with locally made pottery, soaps, and candles, and many more wonderful treasures, there is good reason this comfy shop has won award upon award for gifting the very best on Hilton Head Island. 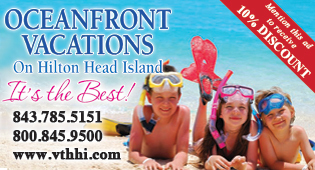 Gifted Hilton Head has that special something that makes customers happy and comfortable and keeps them coming back. A lot of hard work goes on behind the scenes to make it all happen, Taylor said. “You don’t know what it is, but you feel it.” Her team is a big part of making it all happen. “Two of my Gifted girls have been here since day one. 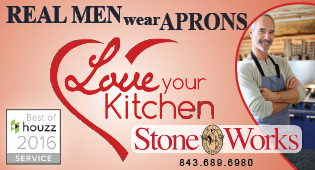 I have a really great staff that know the merchandise well and love helping our customers.” Like the cherry on top, customers are always treated to the shop’s signature, complimentary gift-wrapping services, whether an inexpensive trinket or a lavish present. “We hand-make all our bows and use thick, high-quality paper. That really matters.” Committed to giving her customers what they have come to know and love, when one of their signature papers was discontinued, Taylor bought out the remaining inventory. Taylor and husband Andy Dulick, enjoy island life with their two dogs, who inspire the majority of both their personal and Gifted Hilton Head’s charitable efforts. The shop carries two bracelets designed in collaboration with Luca + Danni. 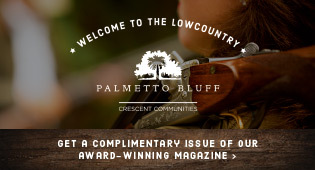 With each purchase, Gifted HH donates $10 to either Palmetto Animal Leagues (PAL) or Hilton Head Human Association. “I really want this to be the friendliest store,” Taylor said. 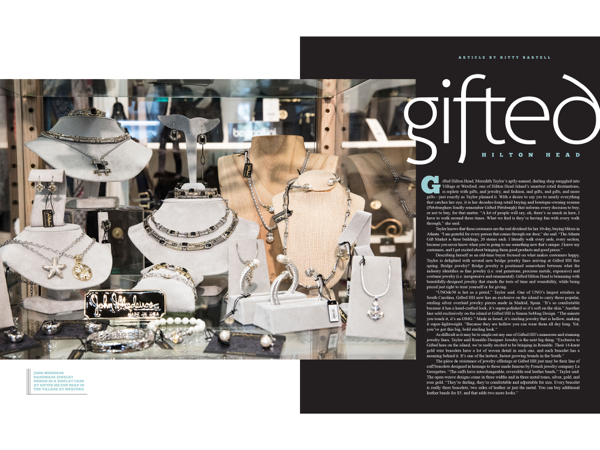 Gifted Hilton Head is exactly that, and so much more: gifts, and jewelry, and fashion, and gifts, and gifts, and more gifts—just exactly as she planned it. Gifted Hilton Head is located at 1000 William Hilton Parkway, Village at Wexford, Hilton Head Island. 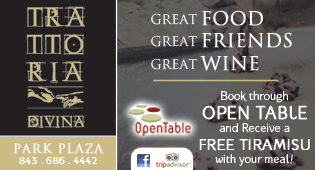 For more information, please call (843) 842-8787 or visit giftedhiltonhead.com.